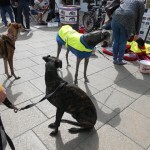 Rosemary and Philip along with their beautiful adopted greyhound Sean, had a very successful day in Sheffield. 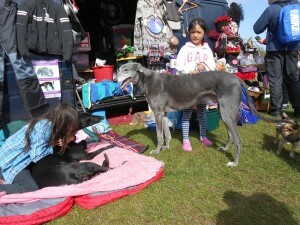 The area was very busy all day due to a very popular European market set up in the area. Not only bringing in many locals but also swarms of holiday visitors. 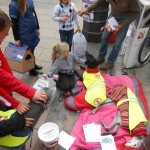 So more chance to raise awareness by distributing campaign literature to even more people. 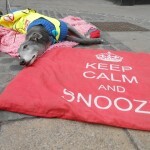 Many people were quite unaware of the mistreatment of greyhounds and were not aware of Rusty’s story and that many thousands suffer as he did. 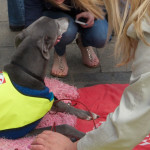 As always, Afg were well supported by Lush, Fargate, seen here with Sean promoting their ‘vote for animals’ campaign. 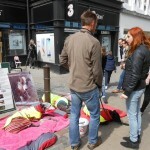 What an amazing day of awareness for Afg in Norwich City centre on May 2nd for our Remember Rusty Weekend event. 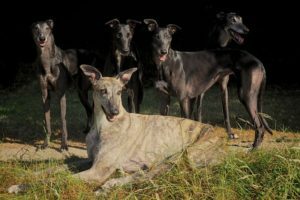 Now Rusty, along with the hundreds of thousands of greyhounds who have suffered and died in the name of greyhound racing have a place in the hearts of hundreds more people. We had a great article in the Norwich Evening News paper prior to the event and 3 journalism students from Goldsmiths college in London, came down for the day to create a documentary on Afg’s campaign which we are looking forward to viewing on its completion in June. 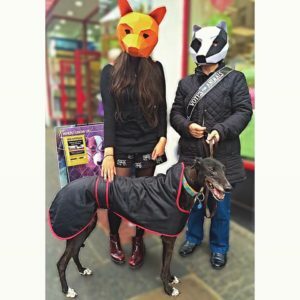 We met a couple with 2 beautiful galgo boys who were adopted from Spain and now all living in Norfolk, the couple realised it is the same abuse these beautiful hounds suffer, the world over. 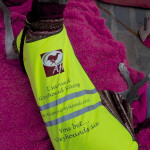 Our beautiful hounds wore their new high viz awareness coats and as usual received lots of admiration and attention throughout the day. We also had our very popular charity stall further up the street which was kept very busy all day with lots of our merchandise and bric-a-brac sold. Hundreds of our awareness leaflets with the special Remember Rusty leaflets attached were distributed today and Remember Rusty posters were displayed around our awareness station. We only have a small area, but make very good use of the space allocated to us. As usual, we have great support from the Lush shop. 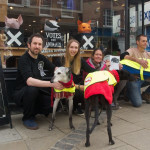 They were running their votes for animals/voice for animals campaign and took photos of our awareness pitch with the hounds, as well as photos outside their shop, which have been posted on their Facebook and Instagram. Lush are so supportive of our campaign and had a Rusty poster displayed in their window all day and gave Afg leaflets to their customers. A beautiful Bank Holiday Monday meant Afg could carry on raising awareness and Remembering Rusty over this busy weekend. This is probably the most popular and largest car boot sale in Norfolk and today was extra busy with hundreds of holiday makers visiting the sale, which meant we had an even bigger opportunity than usual to raise even more awareness and distribute more of our campaign information material. 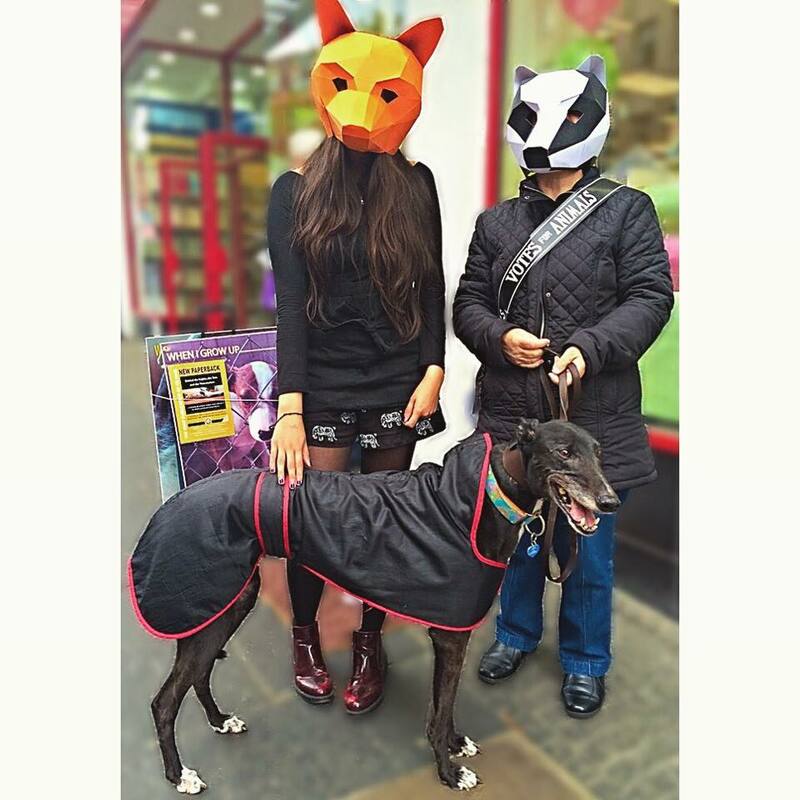 We met many people who told us about their rescued greyhounds and other rescued dogs, it is very encouraging to hear that so many people are opting to rescue animals. Of course we also had many wonderful items of clothing, bric-a-brac and books etc. on sale, which are kindly donated throughout the year for us to continue to raise vital funds as well as many happy customers grabbing great bargains. 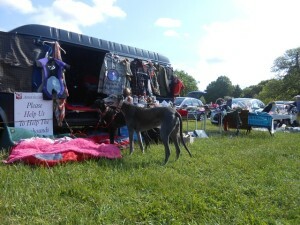 A new local Wednesday car boot sale in the beautiful surroundings of Catton Park. Today was part of the half term week and we met a lot of holiday makers including many children, so were able to raise more awareness of our campaign. As usual, the hounds received lashings of attention from customers and as Catton Park is such a popular dog walking park, we met lots of beautiful hounds of all shapes and sizes, many of them were rescued, which is really great.